Week 9 has been The Week of Free Lunches. Now this doesn't happen all that often in my work environment so it was particularly notable this week, that I had lunch provided on Monday, Tuesday and Friday. It has been O-week (Orientation to University) for all our new beginning students. On Monday we had a campus welcome with sandwiches and Tim Tams for lunch. (Got to introduce the new international cohort straight away to that peculiar Aussie biscuit delight - the Tim Tam). Tuesday was Faculty welcome with the new Science and Engineering students. Pizza, Hot roast chicken and salad for lunch seasoned with a million questions from students. Friday was orientation for new Honours students - sandwiches and hot asian nibbles with lots of nice tea, coffee and fresh orange juice. I love this time of year with the promise of a new group of enthusiastic students. The world is full of possibilities and reality is yet to hit. It has a also been a week of fairly steady rain (which we badly needed). After nearly a month and a half of continuously burning the bushfires in our region are finally officially out and maybe the middle fire-fighter daughter may get to sleep in her own bed at home for longer than a few days at a time. Oh and summer officially ended on Thursday of this week! Day 57: Re-finishing the pew. The head of the household's current DIY project coming up beautifully. Day 58: My peg bucket doubles as a rain gauge. Who knew pegs could swim? This is one day's worth of rain. Day 59: Sleeping Beauty. Clearly year 12 is too hard if this is what happens when you attempt to do some homework before tea. 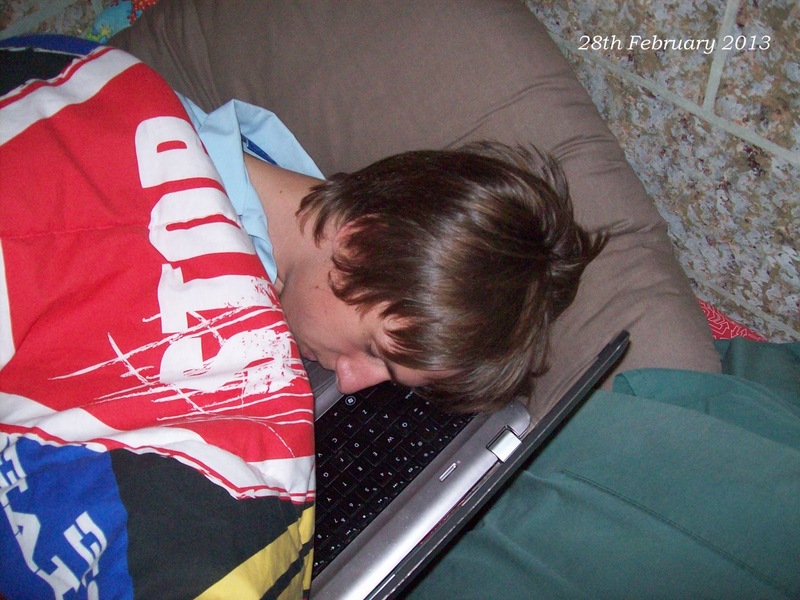 When asked how he could possible be comfortable sleeping on the keyboard of his computer, the boy replied "It's warm!" Day 60: The circus is in town. This is a half an hour to midnight on the way home from picking the boy up from an 18th birthday party. Day 61: The washing mountain. This is a common phenomenon in my house by the weekend. Clean washing tends to accumulate in baskets and piles till someone has enough time to fold it and put it away. It's worse that usual this week as the middle daughter came home from a week's deployment up bush with about 3 loads of dirty clothes. It has been conquered now though! Day 62: A not so scary wolf. My cuddly couch companion. We hung out together on a quiet Sunday afternoon knitting a 21st birthday beanie, blogging about Alan Dart and watching V8 Super Car racing. Day 63: Year 12 Chemistry homework under sufferance. It says "Exterminate Chemistry". There are Daleks drawn on all the blackboards in my house (yes - there is more than one!). The boy is a giant Dr Who and Dalek fan (but clearly not a fan of Chemistry or homework for that matter). Thanks. I find it really makes me look at everyday things much more closely when you taking a photo every day. And then using the photos to tell the story of your week is interesting. I'll have a unique record of this ear at the end!